From time-to-time I'd like to take a minute to kinda spotlight or highlight a particular feature of our church website at yourlifequest.org. This week I'd like to tell you about a really cool feature that's been added here in just the last couple of months: it's our prayer request form. As you may or may not know, our church has a ministry called the Prayer Connection. It's made up of a big team of people who believe in the power of prayer and are willing to take time out in their life to actually talk to God about needs people face & want prayer for. In the past, you had to fill out a form at our Welcome Center OR email/call one of our Prayer Connection coordinators to get the word out to the rest of the ministry. But now our website provides an easy, accessible way for people to share their prayer requests...even if they don't have access to the contact info of one of those coordinators! One more thing: Perhaps you're someone who already has a preferred method of submitting your prayer request (i.e. for me, I often find it easiest to send mine via email). Why should you begin to use the prayer request form on our website? One reason I'll offer is this: Submitting your prayer request online helps our prayer ministry stay organized. Our site actually automatically compiles a spreadsheet that tracks prayer requests and our Prayer Ministry Team can then use that info in a lot of great ways to improve the prayer ministry of our church. 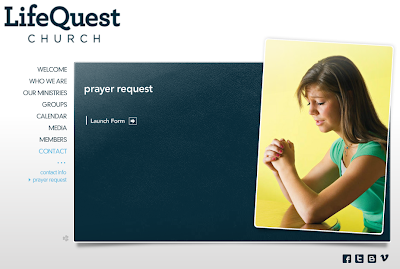 So next time you have a prayer request, give our website's Prayer Request form a try!